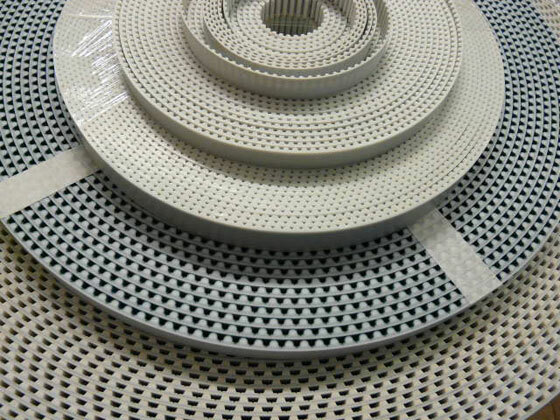 As a UK distributor of German manufacturer Atlatos, we are able to offer a full range of linear synchronous belting in either PU or rubber with standard steel, polyester or aramid (Kevlar) cording. These belts are top quality German manufactured where the factory specialises in linear belt production. 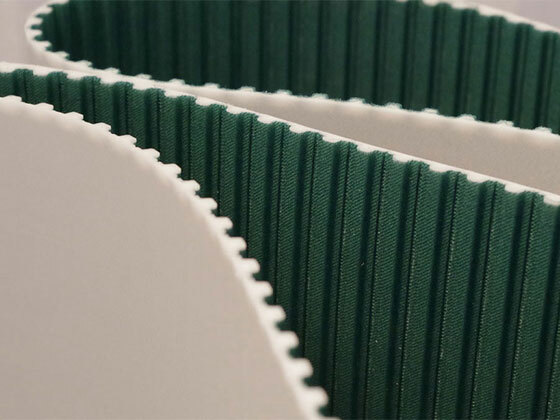 The range of belt sections available is exactly the same as those detailed on our page a good percentage is available from stock here in East Yorkshire where we are happy to cut from 100mtr stock rolls any length required, we do not apply any minimum cut lengths. If the stock is not available from our Driffield warehouse we can obtain, generally within 2/3 days directly from Atlatos in Germany. PU belts are available with standard plain PU teeth or coated with a Nylon cover for low noise, generally called NFT (Nylon faced teeth) as per the picture alongside.